A spacious home with grand vaulted white ceilings filled with light isn’t in the budget for every homeowner, but creating a space that feels open and airy can be achieved even in the most Lilliputian abode. Decluttering, playing with light effects, and limiting the amount of large objects you have in a single room will change how you interact with it and the way it feels. Every room in your house should make you feel like you can stretch your arms, take a deep breath and have room to spare. Is every shelf of your bookcase full of random stuff? Can you never seem to keep the clutter down? Finding a proper place for things will help you open up some spaces in your house. Pockets of clutter are everywhere and finding them will make your house feel open. A bookcase shoved full of rubbish will bring a room in a few feet even though it isn’t adding any actual bulk, and knowing that the second you open your desk drawer it will explode with scarves, scraps of paper, and other clutter will limit the amount of space in your house. For much of your clutter you can ask yourself: Will I use it this month and does it make me happy? If the answer is no, toss it. If clearing out your house doesn’t add the space you want, or if it’s light that make your home dingy, try playing some tricks with color or mirrors, or just get rid of the dust in your home. You can play with color in your home to add space and depth. White is a great default color because it adds light and goes with everything, but playing with color gives you the opportunity to carry the eye throughout the room. Painting a room a light shade of green, while doing the ceiling in an off shade will force the eye upward, giving the impression of a higher ceiling. If gem-tones (like emerald, sapphire, or a deep garnet shade) are what you're after, try painting just the ceiling and the far wall in that shade; it adds depth to a room and makes it appear longer. 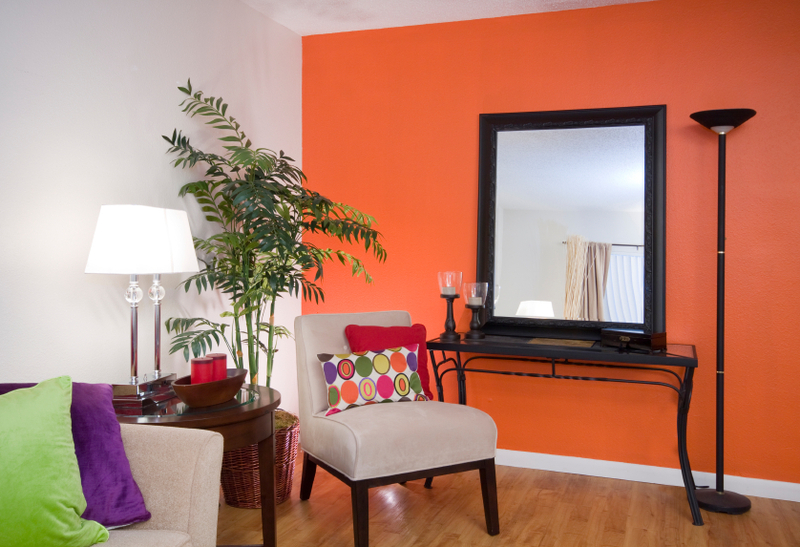 Whatever you colors you decide to paint, continue it with a central, simple theme that you can carry around the room. If you decide to paint the walls a very light pastel green, adding accents of pastel green throughout the room will throw the eye and give an impression of space that might be missed with a more complicated theme (like using brocade fabrics, or a multi-color spectrum). Mirrors are perfect if you need to expand on a small space or just add light to a dim room. There are several key locations for a mirror to be set that may seem counter intuitive to their purpose. While it might seem most pragmatic to set a mirror right by the door, often times there isn’t enough light there. Placing a mirror opposite a window or in any sunny location will bring more light to a room. You can even place one next to a window as a way of ‘faking’ a window. If your tiny home is extraordinarily well lit but you want more space, placing a large mirror as the centerpiece for a wall can trick someone into thinking there is another room. Just make sure to not place mirrors in direct view of each other in a narrow room. Reflections of a mirror on a mirror will create a shadow and bring the size of the room down. Do any rooms have two desks or is there an extra huge couch in the living room? If those extra pieces of furniture aren’t getting used, they are just space-wasting pieces sitting in your house. Pick one large piece of furniture as a focal point for each room of your house and keep the other pieces small enough to function as satellite pieces. It’s often best that the largest piece of furniture be the thing that is going to be used the most. So if you do more work in the living room than TV watching, consider getting a smaller loveseat and chairs so you can devote more space to the desk. If you have a huge bed in your bedroom, don’t add a large desk in the room unless you take your work home with you often. Take some tips from home stagers to make smart furniture location decisions. Place furniture along walls, but with enough room to walk around to force the attention to a central location in the room. This is best done when each room has a central purpose. If you are designing around multi-purpose rooms, consider easily removable furniture. Like a desk that folds into the wall, or a longer folding table that can be tucked into a corner when not in use. These key furniture decisions will give you more space where it is needed and allow you more room to breathe. Giving yourself an endless amount of space might not be possible in your current home, but you can still get the feel of a large house with these tips.